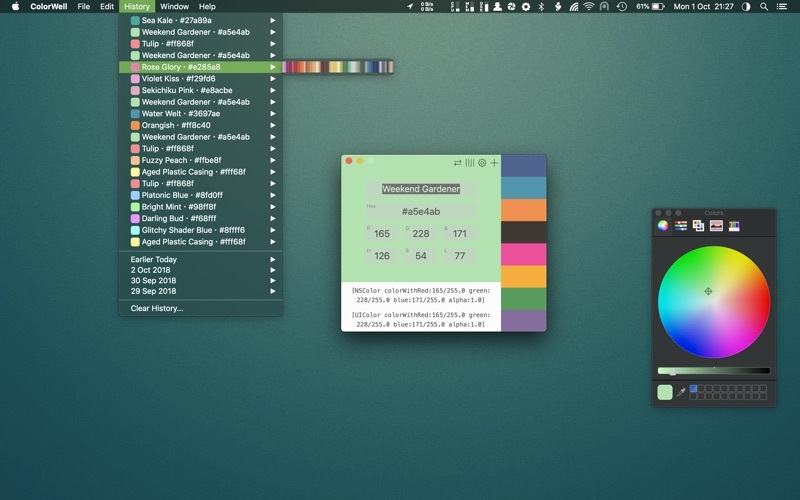 A Beautiful and Intuitive Color Picker and Color Palette Generator - A necessary addition to any web/app developer's toolbox! 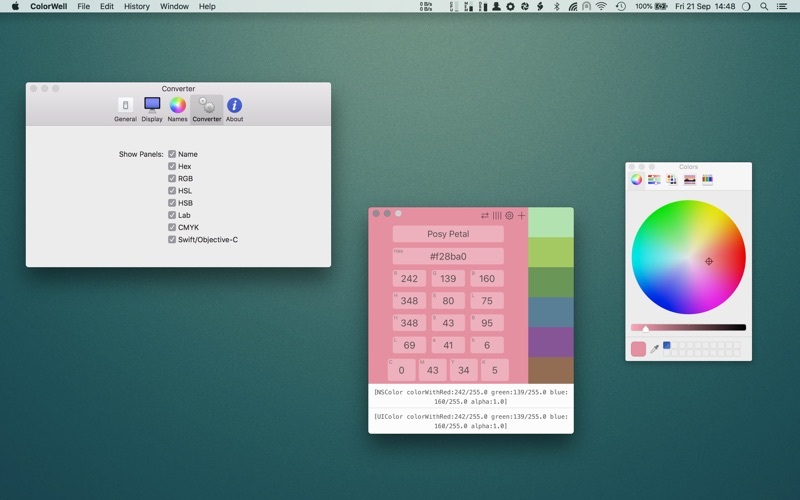 It’s super easy to generate unlimited Color Palettes with quick access to all color information, and on the fly code generation for app development. 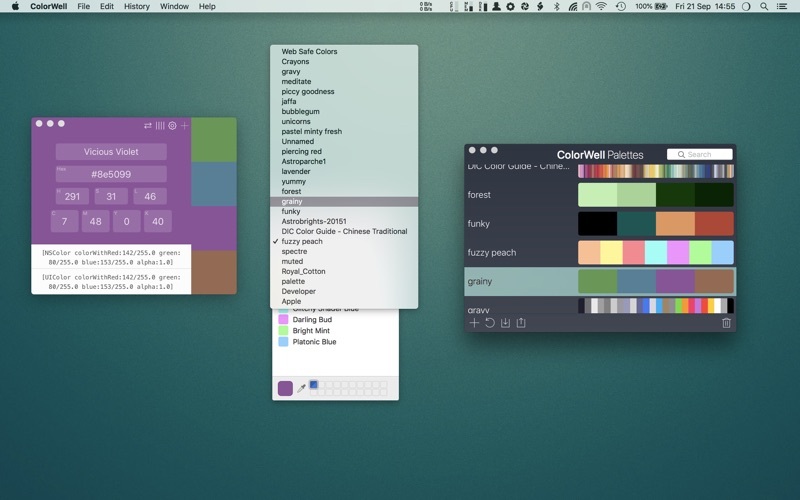 The editable Palette database allows you to archive and restore any color palette for later use with super quick search. 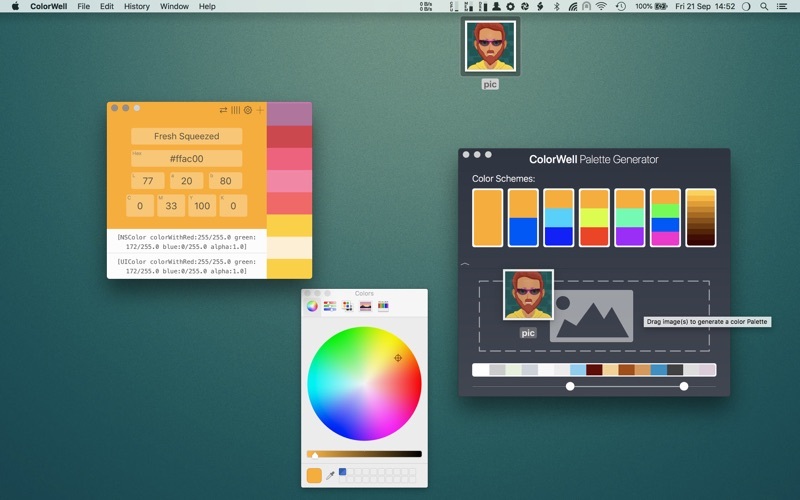 All your carefully crafted palettes are synchronized to the macOS System color picker. 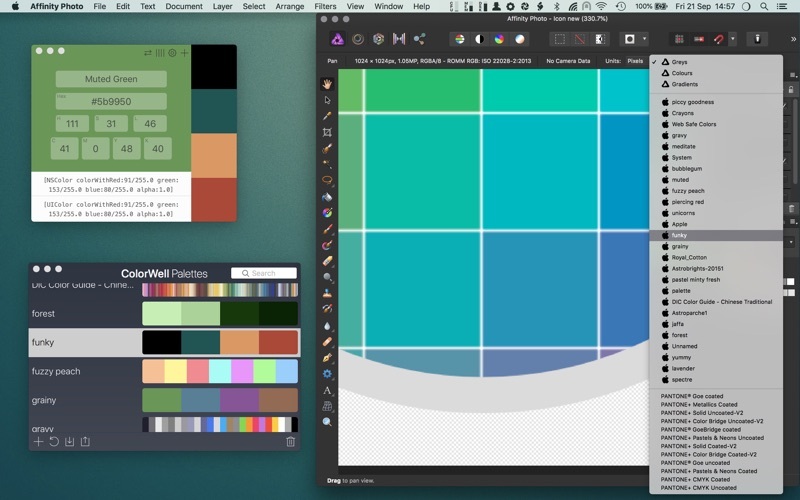 So, all your color schemes are available for use in Pages, Affinity Photo, Final Cut Pro or any other first class macOS app! Its super easy to import and export Palettes to Adobe .ase, and Apple .clr file formats. 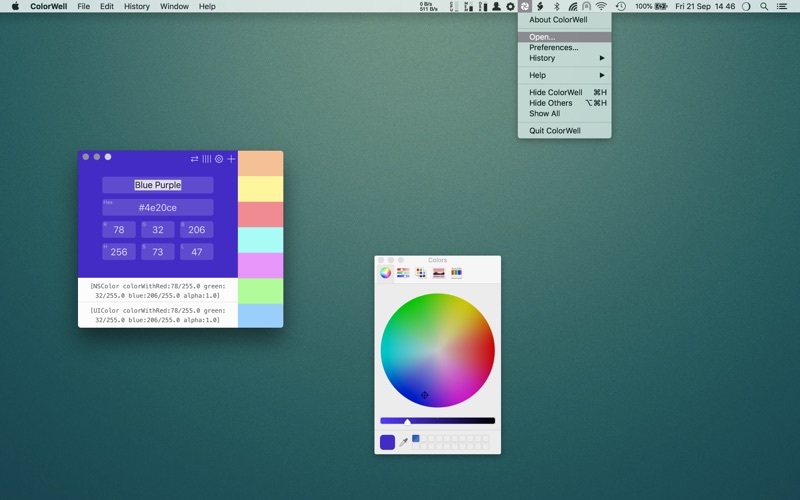 And, naturally any imported palettes will be added to the macOS System color picker for reuse in all other apps. There's no need to remember every little change you make, as all color state changes are saved to History for easy recovery. 17,000+ color names are baked right into ColorWell, making it a little easier to remember any colors you happen to generate. 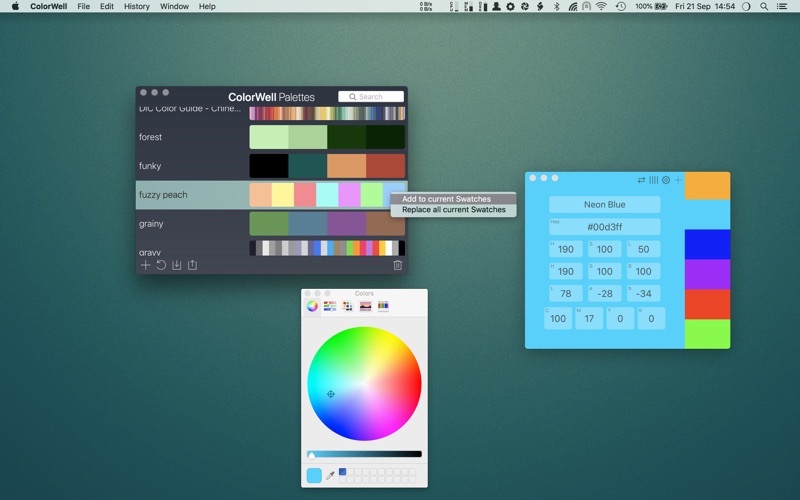 Access to the MacOS Color Wheel can be tedious by default, but ColorWell can be configured to show it via global hotkey or a quick mouse click from your system menu bar. This allows you to quickly grab hex/rgb/hsl/hsb/Lab/cmyk and code snippets from any color source. If you’ve ever needed to quickly generate a color palette from a source (or multiple source) image(s), then the Palette Generator is exactly what you need. You can grab any source image(s) and drop them into the Generator window to generate a color palette of the most common colors present in the image(s). Of course you can save any palettes you generate in the ColorWell Palette database! -Quickly eyeball any color name / hex / rgb / hsl / hsb / Lab / cmyk color. 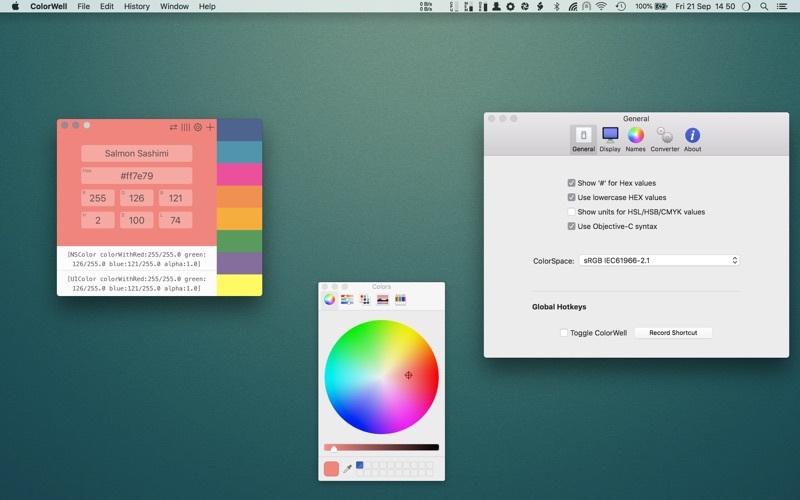 -Quick conversion of color name / hex / rgb / hsl / hsb / Lab / cmyk or the colorpicker into NSColor / UIColor Objective-C or Swift ready code. Other Apps by SweetP Productions, Inc.